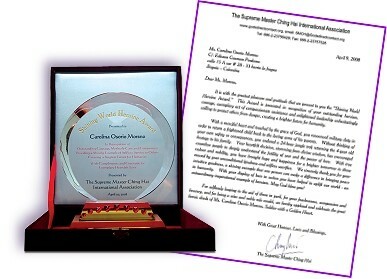 A former member of the Revolutionary Armed Forces of Colombia (FARC), known as “ La Negra,” recently received the Shining World Heroine Award from Supreme Master Ching Hai. In December 2007, La Negra carried a kidnapped boy named Brian, traveled 24-hours nonstop through the jungle and returned him to his family after caring for him for six months. Brian’s parents were extremely happy and relieved to see their son was in good health. They were grateful for their rescuer’s change of heart. We wish our Colombian Shining World Heroine the greatest of God’s blessings and love!